What do you think about on a hot day like today? Well, Veronica, it seems, starts thinking about winter craft shows! November 17th is the day to come in a shop around the Museum this year. Vendors can find an application form at Huroniamuseum.com (through the link below). 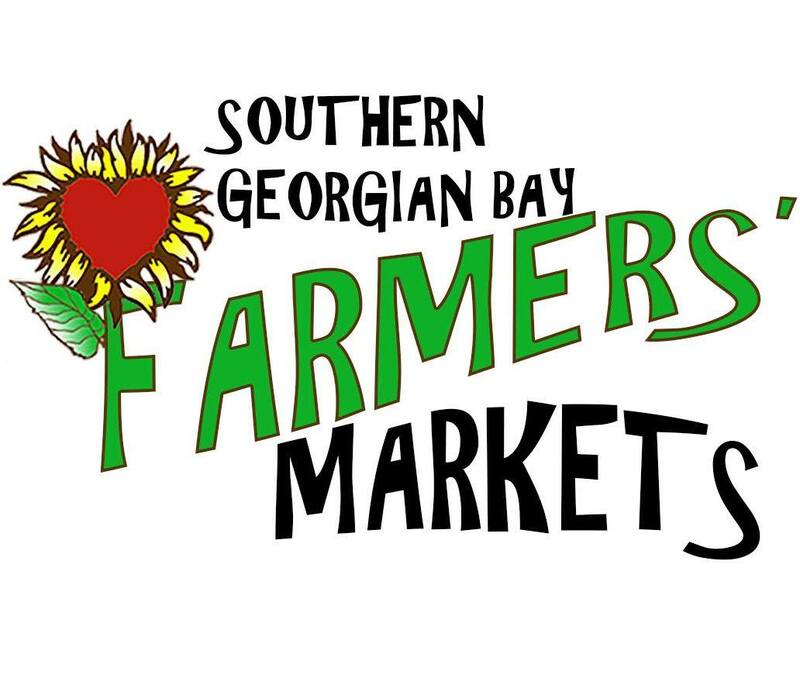 Vendors are now full, a wait list will be held for any interested parties after October 11. Tickets For Heritage Dinner have arrived! Hot off the press! Tickets are available here on our online store or in person at the Museum (549 Little Lake Park Road). Canadian Historical Consultant to Canada, A People’s History to present as guest speaker at Huronia Museum’s annual Heritage Dinner. Bringing history to the screen involves unique challenges. How do you integrate truth with entertainment? There are many aspects to being the onset historical advisor for film or television projects. Whose stories are worth telling? When does subjectivity cross the line to downright lies? How can you tell big stories with limited budgets? How important are the “details”? Join us at our annual Heritage Dinner to hear Peter Twist, Director of Historical Reconstruction, talk about breathing life into history on film and television, He will discuss the pleasures and pitfalls of working on two major Canadian history documentary series; ‘Canada- A People’s History’ and the upcoming ‘Canada – The Story of Us’. Peter Twist is well known around the world to museum curators as well as film, television and event producers. With a background in fine arts, engineering and teaching, his knowledge of historical topics and events span all periods around the globe. He continues to be active in the heritage community as a museum board member and event organizer. He writes, lectures, hosts workshops, and has been instrumental in training and establishing a system of command in North America’s British Napoleonic Re-enactment Community. He holds memberships in numerous societies including the Company of Military Historians and has been certified as an Historic Weapons Supervisor. The Heritage Dinner takes place on Friday, May 12th 2017 at 5:30pm at the North Simcoe Sports and Recreation Centre, in Midland, Ontario. There will be a silent auction, dessert auction and bar. Tickets are available on-line, or at the Museum for $80 ($40 tax receipts can be given.) For more information, please contact the museum at 705-526-2844. 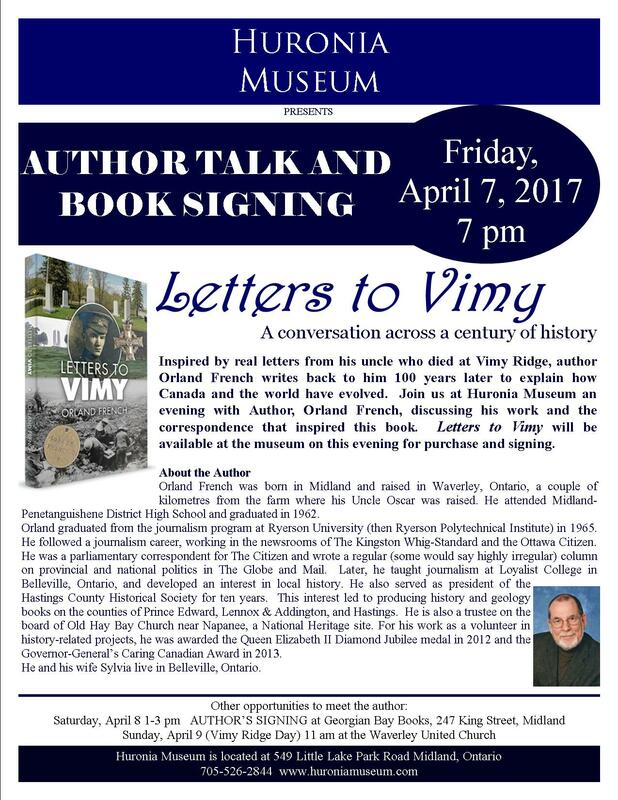 Author Orland French, author of Letters to Vimy, to visit Huronia Musuem and North Simcoe on Vimy Ridge weekend for mini book tour. Huronia Museum invites the community for an evening with author, Orland French, discussing his work and the correspondence that inspired this book. Inspired by real letters from his uncle who died at Vimy Ridge, author Orland French writes back to him 100 years later to explain how Canada and the world have evolved. Letters to Vimy will be available at the museum on this evening for purchase and signing. About the author: Orland French was born in Midland and raised in Waverley, Ontario, a couple of kilometres from the farm where his Uncle Oscar was raised. He attended Midland-Penetanguishene District High School and graduated in 1962. Orland graduated from the journalism program at Ryerson University (then Ryerson Polytechnical Institute) in 1965. He followed a journalism career, working in the newsrooms of The Kingston Whig-Standard and the Ottawa Citizen. He was a parliamentary correspondent for The Citizen and wrote a regular (some would say highly irregular) column on provincial and national politics in The Globe and Mail. Later, he taught journalism at Loyalist College in Belleville, Ontario, and developed an interest in local history. He served as president of the Hastings County Historical Society and trustee on the board of Old Hay Bay Church near Napanee, a National Heritage site. This interest led to producing history and geology books on the counties of Prince Edward, Lennox & Addington, and Hastings. For his work as a volunteer in history-related projects, he was awarded the Queen Elizabeth II Diamond Jubilee medal in 2012 and the Governor-General’s Caring Canadian Award in 2013.